For use with Left Return. Desk and Return sold and shipped separately—ORDER BOTH. A modular management solution that combines stylish profiles and elegant accents with top-grade fit and finish. Abrasion- and stain-resistant laminate with elegant hardwood trim. Drawers ride on steel ball bearing suspensions; file drawer extends fully and accommodates letter and legal size hanging files, box drawer extends three-quarters. HON® "One Key" core removable locks make re-keying quick and easy. Full-height modesty panel for privacy. Two grommets on worksurface for cable management. A modular management solution that combines stylish profiles and elegant accents with top-grade fit and finish. Abrasion- and stain-resistant laminate with elegant hardwood trim. Drawers ride on steel ball bearing suspensions; file drawer extends fully and accommodates letter and legal size hanging files, box drawer extends three-quarters. HON® “One Key" core removable locks make re-keying quick and easy. Full-height modesty panel for privacy. Two worksurface grommets for cable management. For use with Left Return. 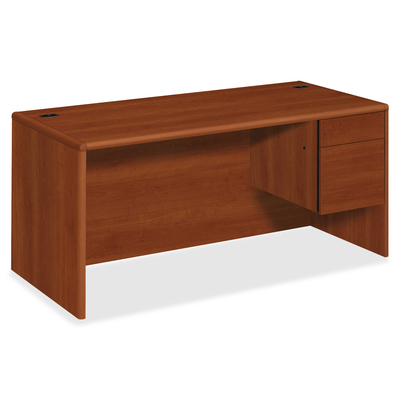 Desk and Return sold and shipped separately -- ORDER BOTH.